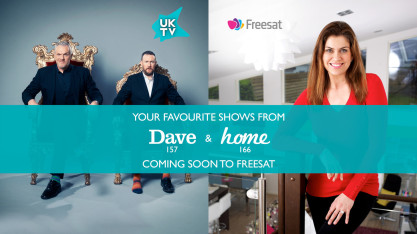 Dave and Home are to launch on the free-to-air satellite service Freesat, giving Freesat users access to all of UKTV's free channels for the first time. From 1st August 2017, Dave will be available on Freesat channel 157, with Home appearing on channel 166. Dave is one of the UK's most-watched non-PSB channels and hosts a mix of comedy and reality shows, including new and original commissions, established favourites, and hit series from America. Winner of Best Entertainment Channel at the 2016 Broadcast Digital Awards, Dave's original content includes Taskmaster, Dave Gorman Modern Life is Goodish, Alan Davies: As Yet Untitled, Crackanory, Red Dwarf XI and Dara O'Briain's Go 8 Bit. Demand for the channel is likely to be high: Freesat viewers have repeatedly called for Dave to be added to Freesat ever since the satellite service launched in 2008, with frequent requests on social media and forums. The other channel joining Freesat is Home - the UK's only dedicated homes channel, bursting with inspirational home and gardens programming such as My Flat-Pack Home, Nick Knowles' Original Features, Make My Home Bigger, Fantasy Homes by the Sea, and Kitchen SOS. Hit series on Home also include Extreme Makeover: Home Edition, DIY SOS, Escape to the Country, The Hotel Inspector and A Place in the Sun: Home or Away. Home first went free-to-air on Freeview in 2016 and describes itself as providing "welcoming, energetic and stylish programming". UKTV first made three of its Freeview channels - Drama, Really and Yesterday - available on Freesat at the end of 2015. The addition of Dave and Home will mean that Freesat viewers will be able to access the same range of UKTV channels as on Freeview. "Everyone at Freesat is 100% thrilled that these two iconic and hugely popular channels are coming to Freesat, where they will be available to watch for free. We are all about giving our 4 million viewers the most compelling content and Dave and Home are spilling over with both new and established shows that people love watching. Our substantial audiences can easily find them using our great electronic programme guide and app." "We're delighted to be launching Dave and Home on Freesat. With original programmes such as Taskmaster and Dara O Briain's Go 8 Bit, Dave is one of the nation's most watched non-public service channels and Home has grown by over 20% year on year thanks to shows such as Ground Force and Escape to the Country. Launching on Freesat means UKTV will be entertaining more viewers than ever before." Both Dave and Home will shortly switch to free-to-air status on satellite ahead of the Freesat launch, enabling anyone with a generic free-to-air satellite receiver within range of the Astra 2 spotbeam to access the channels. We got Home & Dave on Freeview way before Freesat. Note that this isn't as easily possible with Sky Q due to different LNBs. However what you suggest is easily applied if you have Sky HD or Sky SD. Not yet, but the encryption will be dropped by 1st August 2017. Home and Dave won't be HD I guess ? SD only. HD only via pay TV.